This chair is a beautiful example of an occasional chair. A striking design, including feature hardwood legs, deep buttons and studs. A great model for personal individualisation. 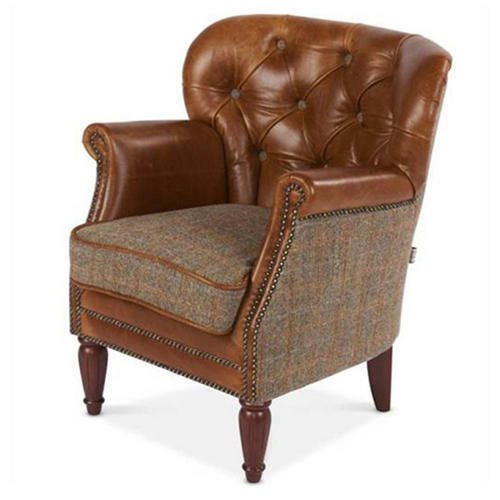 This sample shows it with Harris Tweed Gamekeeper Thorn cushion, outer arms and back and Cerato brown leather back and buttons and piping. This collection is the result of a contemporary hint on the great classic design. Buttoned back and arms incorporating plush piped seat cushions and elegant proportions combined with vintage leather and castor wheels to finish this beautiful collection.